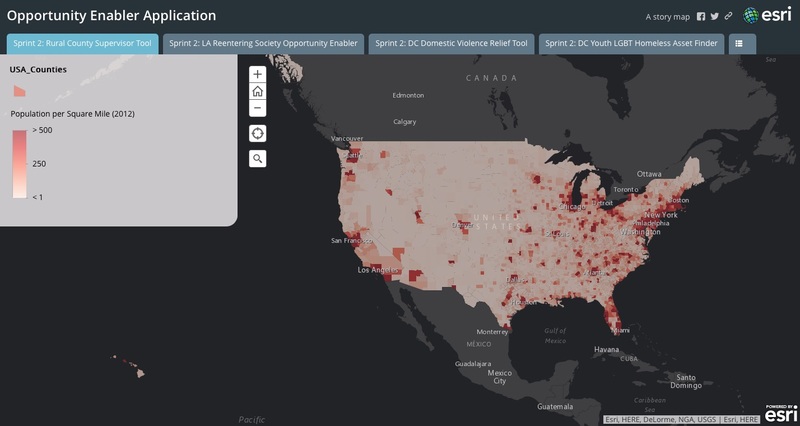 Today, Esri is demonstrating its ongoing commitment this White House initiative coordinated with the Department of Housing and Urban Development, and the Census Bureau with the release of the Opportunity Enabler Tool that includes a series of specific applications designed for homeless LGBT youth, survivors of domestic violence, and the formerly incarcerated now facing the challenges of work force re-entry. Combined, the web applications include a series of nationwide opportunity indexes (Environmental Health Hazard Index, Jobs Proximity Index, Labor Market Index, Low Poverty Index, Low Transportation Cost Index, Location Affordability Index, and School Proficiency Index) from the Department of Housing and Urban Development and American Community Survey data from the Census Bureau, along with incorporation of other public open data to help make every citizen’s search for opportunity more easily obtainable, including each of the personas in the Opportunity Project. All of the applications were built using the ArcGIS Platform. To more easily enable governments and community focused organizations to lift up every American, Esri has incorporated opportunity data into its ArcGIS Platform and Community, and Business Analyst tools that host more than 100,000 user session each month. The Story Map developed for this project pulls all of these tools, the context of the project, and opportunity data sources together in one easily digestible way for public consumption. All are included on opportunity.census.gov and also Esri’s public platform. One of the applications developed to provide data easily to at-risk personas. In this example, information on schools, jobs, and public transportation can be easily accessible by people new to an area. Check out the Story Map and see how easy it is for anyone with a mobile phone or web browser can leverage open data with the ArcGIS platform. And any organization interested in creating specific community solutions can do so easily. Check out Esri’s NPO program for more information.